Colorful Easter eggs and items your boyfriend will love can fill his basket on the holiday. An Easter basket for your boyfriend can include candy and the typical Easter items, but you can also be creative and make a basket that incorporates his hobbies and interests for the holiday. An Easter basket that you create on your own is a thoughtful way to celebrate the holiday. Along with the traditional Easter eggs and candy, put a few items in the basket that pertain to your boyfriend's hobbies and interests. Video games, books and golf accessories are examples of the items that you can add to the basket. When you include special-interest items in the basket, you are creating an Easter basket that is perfect just for him. Make your own Easter candy to put in the basket. Colored Easter eggs, homemade marshmallow peeps and chocolate-covered candy eggs made in your own kitchen are a few items to include. Add homemade Easter cookies in the shape of bunnies and chicks. 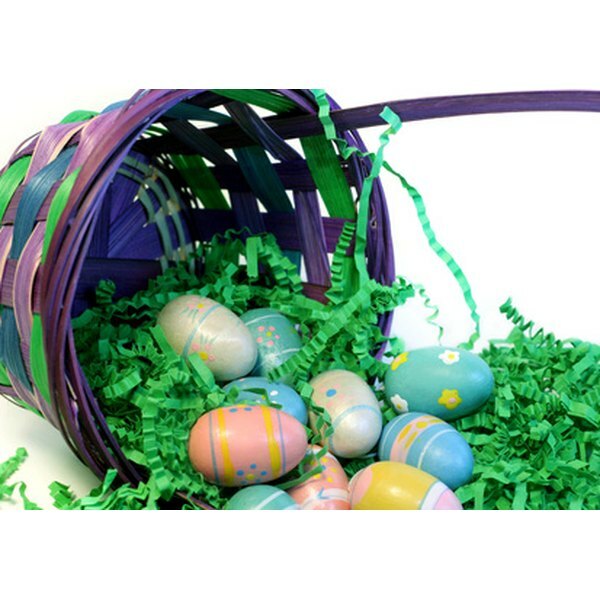 Apply some final touches to the basket such as ribbon and green Easter grass. Make your boyfriend’s Easter breakfast with a basket that includes the fixings for a breakfast meal. The basket can include thick slices of ham, biscuits, maple syrup, pancake mix and gourmet coffee. Add some fruit preserves in your boyfriend’s favorite flavors to top off the biscuits. You can present the basket to your boyfriend on Easter morning and make him breakfast for a special treat on the holiday. Try something different for your Easter basket gift for your boyfriend and include healthy treats and snacks. For sweet snacks, include fruits instead of traditional Easter candy. Use trail mix for a healthy snack and put it in Easter egg containers for a festive holiday touch. Fill containers with dried fruits such as raisins and decorate the containers for the holiday.